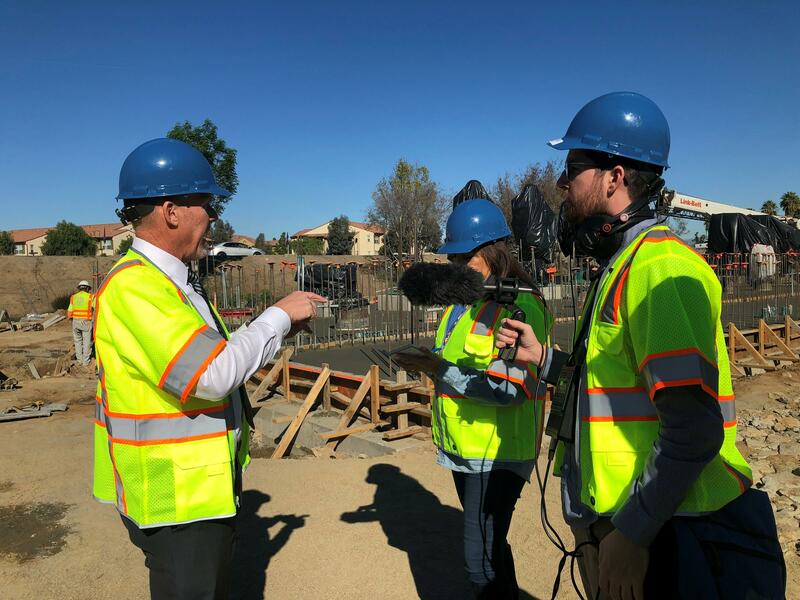 KVCR's Benjamin Purper and Lillian Vasquez take a tour of the Sterling Pump Station given by Craig Miller, General Manager of Western Municipal Water District. Southern California gets much of its water supply from Northern California - so what will happen if the "Big One" - a major earthquake - cuts that supply off? KVCR's Benjamin Purper finds out in this report. I’m touring a construction site near Western Municipal Water District’s headquarters in Riverside. The water district is expanding a facility called the Arlington Desalter, which could provide fresh water to customers in the event of a large earthquake. Craig Miller, General Manager of the water district, says desalters like this pump up water from the ground and desalinate it. Once expanded, the Arlington desalter will provide 6.4 million gallons per day of water for the region. But the desalter doesn’t just provide another water source. Miller says that Southern California relies on imported water from Northern California to get all the water it needs. Miller says if that water supply from the North gets cut by a major earthquake, it will be important to have groundwater resources like this one. But Western isn’t the only district preparing for the Big One. While Western Municipal Water District covers parts of Riverside County including Temecula and Corona, Metropolitan Water District covers most of the rest of Southern California. They serve water to Ventura, Los Angeles, Orange, San Bernardino, and Riverside Counties. Brent Yamasaki is the Assistant Group Manager of System Operations for the Metropolitan Water District. He says it’s hard to know what will happen when the Big One hits, but that the water district does have some contingency plans in place. Yamasaki says the Metropolitan Water District’s back-up sources could provide most of Southern California with a six-month supply of water. Californi relies on the snowpack for nearly a third of its water supply. But as Capital Public Radio's Ezra David Romero rfeports, it's predicted to drasticaly shrink. Two different water bonds are set to appear on the ballot this election season. The Secretary of State's Office announced the latest on Wednesday. It is a nine billion dollar measure that has gathered enough signatures to appear in November. Capital Public Radio's Ben Bradford reports. The state Assembly will vote today on a bill to assess the number of buildings in the state that are susceptible to a major earthquake - many of which are in Southern California. KVCR's Benjmain Purper has more. Hundreds of buildings across the Inland Empire are vulnerable to extreme damage and danger to occupants in the event of a major earthquake. The analysis by the Los Angeles Times finds IE officials have not responded to the vulnerability like officials in Coastal communities have. More from KVCR's Ken Vincent.